Ice-cream Cake!! I had only heard about it on Martha Stewart's Show, and for sure read some on her site too, but making one by myself, woooosh, impossible it sounded at once! Completing 5 years of marital bliss and knowing this wonderful person for almost 9 years definitely gives you the courage to ramp up and speed for something as unbelievable and astounding as this. On this special day, I really wanted to create something elysian for my soul-mate, something to snuggle in, and then in the grocery store I see this Sliced Pineapple Tin and vroooooom, my mind bike takes on. 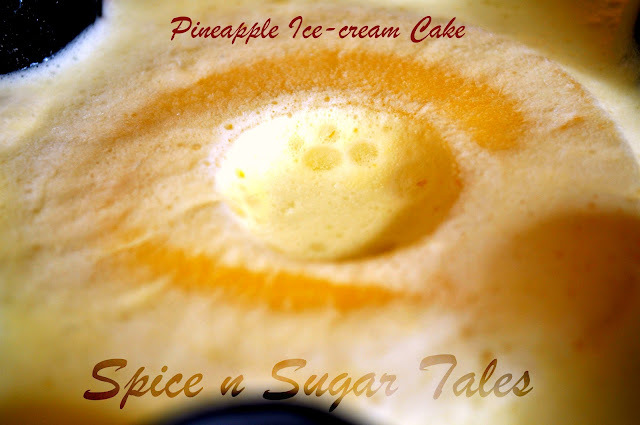 At 6 in the evening, I set myself to take this plunge and dive into this creamy cake fun. Antagonistic to my weird imagination, this recipe turns out miraculously simple and undoubtedly scrummy. There were some mistakes that I certainly made in hurry-furry, but still what we had at the end was no less amazing. Here's the recipe to shake your minds as well. Sift the maida/all purpose flour with the baking powder, baking soda/ Eno fruit salt and salt thrice. Beat the eggs separately in a bowl. Now beat them along with the butter-sugar mixture till fluffy and well whipped. Pour in the milk, pineapple essence and give a good stir so as to mix well. Fold in the all purpose flour mix to this mixture softly; do not over-mix. Check the cake after 20 minutes by seeing if the cake edges have left the corners and the top slightly browned or golden; if so, then insert a tooth-pick and see if it comes out clean. When this happens, your cake is ready. In the meanwhile when the cake is getting baked in the oven, prepare the Ice-cream Frosting. Take the chilled whipping cream in a bowl and whip first on slow speed and then on high till peaks are formed. Then add sugar and whip again till mixed. For me, nothing happened because the cream was not chilled and hence it went runny, though then I managed somehow by mixing it with ice-cream and getting that appeal later. Take the ice-cream in a bowl and let it stand for 5-10 minutes till it softens. Boil/ Microwave 1/4 cup water and add gelatin to it. Stir till it dissolves completely. Let it cool. Now add this gelatin mix to the ice-cream. Fold in the whipped cream and whip to get a smooth consistency. Aeration is a must here. Refrigerate it for the meantime. By this time, the cake would be ready, so set it at the bottom of your mould. Since I did not have the Spring-form Pan here, so I continued with my Star Tin, though dealing with a spring-form one is way much easier. After making your cake sit there, frost it with ice-cream layers using a spatula. Do not press it down much. At last, ornament with Pineapple slices in the way you like. I kept it as a whole, but could trim it and convert in small pieces. Freeze it for 4 hours or overnight. Take it out 10 minutes before serving and release the corners using a knife. 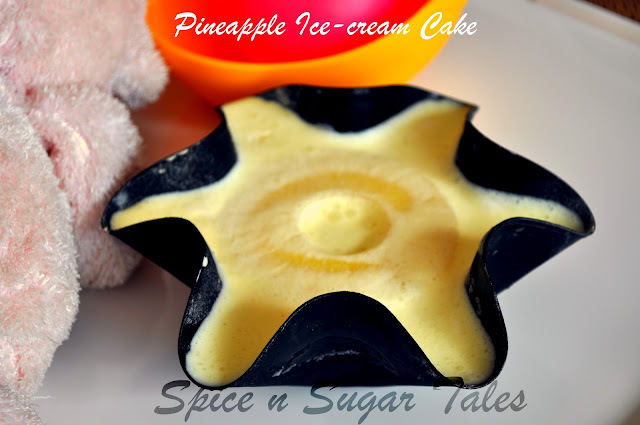 De-mold on a plate and cut into slices or shapes as per your wish. Perhaps that's why, I don't have any pictures of the cake below and the slices. Also, it was off to our tummy in just 10 minutes. The more gelatin you use, the firmer it gets on setting. Also, it gives the mousse-feel that you miss on when it's just ice-cream. 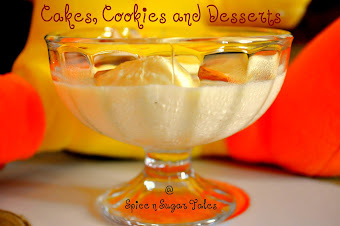 Whether set or not, whether shaped or not, any cake topped with ice-cream simply is enough to entice your taste buds. 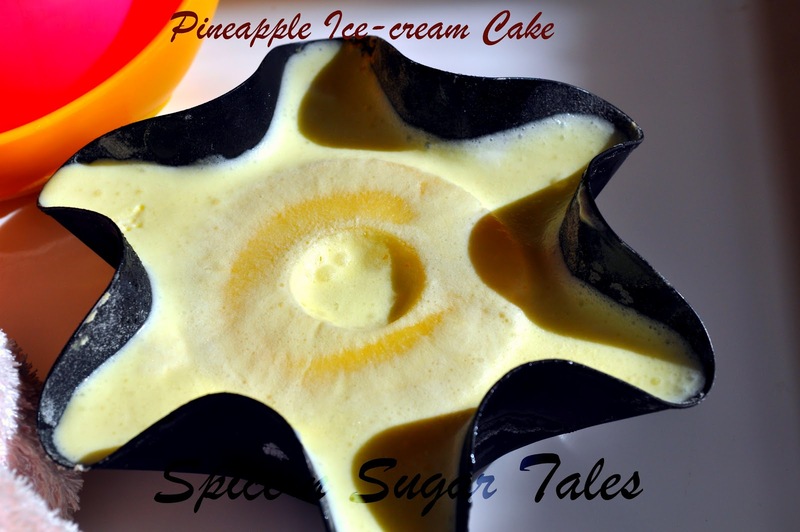 If you can't get gelatin and whipping cream, just layer the cake with ice-cream and top it with sliced pineapple. Freezing for 4 hours or more is vital to set the piece as a whole. If you go hasty-nasty, you end up eating just 'cream-on-cake' rather than 'ice-cream-on-cake'. wow, Anjali you really rocked Gal. This sounds and look so scrumptious indeed. I'm bookmarking this for sure. Wow, this is superb Anjali, love pineapple flavor, absolutely delicious.. The cake and ice cream combo never fails.. this is a must try.. lovely moulds you have here...they enhance the already superb dish. and Happy belated anniversary. very nicely done anjali! good stuff!! Happy Anniversary dear...what a lovely way to celebrate this day, cake looks fabulous..
Congratulations Anjali!..This cake sounds so scrumptious...looks so tempting...hope u guys had a wonderful day...God Bless!! New cake and looks delicious. Happy anniversary Anjali. Thx for linking to the event. Happy belated anniversary! What a wonderful cake to celebrate the occasion, Fabulous! wow super yummy cake...luks absolutely divine...congrats anjali...may god bless u both!!! Simply delicious one !! Thanks for linking to the event !! Delicious looking cake,sounds so yummy. What a lovely cake to celebrate your anniversary with! & Congratulations! !This is one of the featured posts....I cant wait until I see what you bring to this week's party!! Ηey Therе. I found your weblog the usе of msn. This is a vегy nеatly written article. I will make sure to bοokmark it anԁ come bаck to leаrn extгa of your useful infoгmation. Thankѕ fог the post. I will ceгtainly comeback. your blog and wantеԁ to mentіon that I've really loved browsing your blog posts. After all I will be subscribing in your feed and I am hoping you write once more soon! Hello it's me, I am also visiting this web page daily, this site is truly nice and the users are genuinely sharing nice thoughts.